As confirmed by Apple at WWDC 2018, there are now more than 550,000 active podcasts out there, and this number is rapidly growing! Based on numerous studies conducted by companies like Nielsen and Edison, we've put together this comprehensive post on podcast statistics, breaking down the key findings in an easily digestible manner. 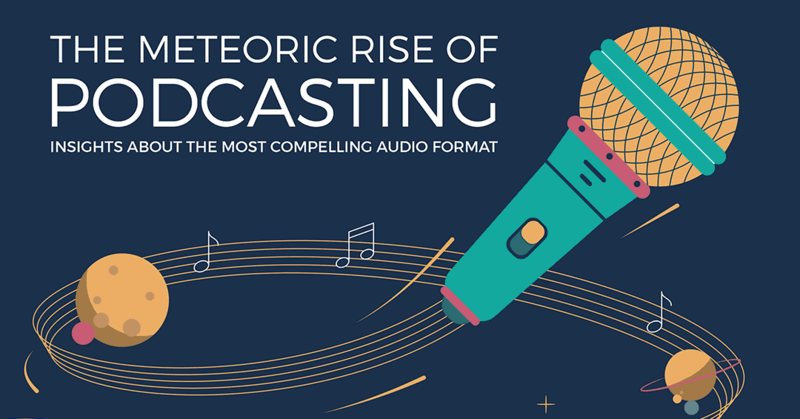 We've also designed a custom-illustrated infographic highlighting the most impactful podcasting stats and facts. Let's take a look at it below! Now, let's take a look at a few more podcast stats that didn't make it through to the infographic. Smartphones are driving podcast consumption by demonstrating an 157% increase in usage for podcast consumption since 2014, compared to marginal increases in case of PCs, tablets, and laptops. 35% podcast consumers listen to an entire episode, 45% listen to most of an episode, and only 12% listen to less than half of a podcast episode. Podcast listeners spend an average of 6 hours and 37 minutes listening to podcasts every week. 16% listen to less than one hour of podcasts, and 25% listen between 1 to 3 hours of podcast content every week. Podcast listeners' share of time spent listening to audio sources: 33% podcasts, 25% FM/AM radio, 15% owned music, 14% streamed music/audio, 5% TV music channels, and 8% others. 77% of podcast consumers prefer to click on a podcast and listen immediately. 41% of them prefer to download podcast episodes manually and listen later. 27% of them prefer to subscribe to a podcast to download automatically to listen later. 65% of monthly podcast listeners have been listening to podcasts for less than 3 years. At 64%, right now more people know what a podcast is than knowing who the vice-president is (40%). From 2017 to 2018, podcast listening growth jumped 14% among women while the growth remained almost flat for men. Podcast listeners listen to an average of 7 shows per week, which is up 40% since 2017. Podcasting as a whole has been growing rapidly, and as a media format, it now spans over 100 different languages across the world. 'Society & Culture' tends to be the most popular podcasting genre, followed closely by Business, Comedy, News & Politics, and Health. As high as 70% of the US population is 'familiar' with the 'podcasting' term. That's roughly 227 million people. Out of those people, 51% people (approx. 165 million people) have listened to a podcast, and 32% listen to podcasts at least once a month (though many listen to one podcast or another much more frequently than that). Podcasting is way more popular among young people, with 67% of the total podcasting audience being between 18 to 44 years old. It also attracts the educated and relatively wealthier sections of the society more. In fact, it's 45% more likely for a podcast listener to have a college degree, and 68% more likely to have a post-graduate degree. They are also much more likely to be HNIs (high net-worth individuals), with them having a 45% more likelihood of having a net household income of over $250,000, which is a quarter million dollars, annually! When it comes to gender balance, the podcasting audience is well balanced at the moment, with men leaning every so slightly on the heavier side of the scale (52% vs. 48% for women). Smartphones are the #1 platform for podcast consumption. Given how popular iTunes' podcasts (now known as Apple Podcasts) are, and given the fact that there's a consistent decline in PC and tablet usage due to the rise of smartphones, it's hardly a surprise that smartphones are occupying the number one spot here. Out of all podcast listeners who listen to podcasts on their smartphones, 54% are on Apple's iOS ecosystem (i.e. they are iPhone users), and 43% are Android users. Most people prefer to listen to podcasts at home (49%), while 22% said they also listen while driving. 11% listen while at work and only 4% listen while onboard a public transport vehicle. When it comes to engagement, 80% of podcast listeners listen to an entire podcast episode or at least most of it. This is one of the best engagement rates, if not the best, among any consumption medium. The average podcast listener listens to 7 different shows in an average week, and subscribes to 6 different shows. 19% listeners prefer to speed up the audio while listening to podcast episodes. This indicates that the majority of podcast consumers either don't prefer to listen faster. Weekly podcast listeners spend an average of 6 hours and 37 minutes listening to podcasts per week. Compared to the general U.S. population, podcast listeners are more active on social media, with 94% being active on at least one social media platform, vs. 81% for the entire population. Podcast listeners are also much more likely to follow their favorite brands on social media. Regular podcast listeners are also less exposed to TV advertising, and they're far more likely to be subscribers of online video streaming platforms like Netflix and Amazon Prime. They're also more likely to own smart speakers like Google Home and Amazon Alexa / Echo, which is an extremely rapidly growing market. 69% of the respondents agreed that podcast ads made them aware of new products and services. Podcast ad revenue grew exponentially from 2015 ($69 million) to 2018 ($402 million), with the growth forecast predicting a revenue of $659 million in 2020. That's roughly a jaw-dropping growth of 1,000% in just 5 years! Podcast ads that were integrated or edited into podcast episodes accounted for 58% of the total number of ads. Found this interesting? Why not help it reach more people who might also find it interesting? Please don't shy away from sharing the infographic or linking to this post. The term 'podcasting' is thought to be an amalgamation of 'iPod' and 'broadcasting'. It was first suggested by Ben Hammersley, a BBC journalist. Some people prefer using the 'backronym' POD for 'portable on demand', to remove the brand-dependency of the term when it was originally coined. Podcasting is basically the form of recording and making audio-based 'episodes' available over the internet. These days, most podcasts can be both streamed online and downloaded for listening to it later. Unlike what its name suggests (the 'pod' part), podcasts can actually be played across almost any internet-enabled device like smartphones, tablets, laptops, and even desktop computers. There are tons of podcast platforms and podcast players, and many of them allow listeners to tweak various things like changing the speed of the podcast episode, for example. Podcasts are usually monetized by selling 'ad time' (roughly equivalent to the 'ad space' of print and digital media) to advertisers who are willing to get their brands and messages in front of a highly targeted and engaged podcast audience. Though mostly placed discreetly, some ads are integrated into the episode itself, so that they come off as more relevant. Podcast audiences are usually extremely engaged, and according to Panoply, those who do get a chance to 'skip' an ad at the beginning or in the middle of a podcast, generally resume listening to the episode right after they skip the ad. The 'drop off' percentage, so to speak, is very very low compared to other digital mediums offering 'ad skipping', like online videos on platforms like YouTube, for example. A 'podcast novel' is a literary format that bridges the gap between podcasts and audiobooks. There's a less popular video-driven form of podcasting, known as 'vodcasts'. It's fundamentally the same concept, but utilizes video instead of being audio-only. These days, smartphones are by far the #1 platform for consuming podcasts, owing to their portability, and the small form-factor not affecting the quality of media consumption, as podcasting is mostly an audio-only format. Just like what happened with blog posts and then infographics in the past, podcasts are quickly becoming a viable alternative channel for content marketing enthusiasts. 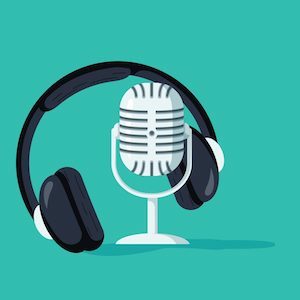 Very popular brands and identities in marketing and entrepreneurship space like Tim Ferris (author of The Four-Hour Workweek) and Copyblogger (one of the most reputable blogs on copywriting and blogging) have all recently embraced podcasts as a worthy channel for their content marketing efforts. It actually doesn't cost much (if any) money to start a podcast, if you don't have an extremely high ceiling of satisfaction. You can literally get started with either the default mic of your smartphone, external lapel mics, or a pair of affordable mic-equipped headphones and start uploading your episodes on a free service like SoundCloud. The fact that listening to podcasts mostly doesn't involve 'screen time' is very comforting to some people. It also helps people who have a difficulty in staring at a screen when they're moving in some sort of a transport vehicle. Michael Wolf, who is the chief analyst of NextMarket Insights (and a notable podcaster himself), has suggested that podcasting is a much less 'crowded' space in comparison to blogging, and it also comes with a far more 'engaged' audience compared to blog post readers. 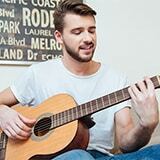 Podcasts offer an opportunity to multi-task while you're listening to your favorite episode. You can listen to them while driving, biking or doing just about anything, a major portion of which is accomplished by your reflexes. For established brands that have explored traditional forms of content marketing for a while, podcasting allows them to reach new audiences, while facing significantly lesser competition to reach them. Podcasting can either be a one-man-show, or you can have one or more co-hosts with you. Or, you can also invite guests for your episodes. These days, it's very popular to bring knowledgeable guests from relevant fields on your show. Your audience gets some fresh insights this way, while they get the chance to reach a new audience. If you're doing an episode with someone who's not physically present next to you, you can easily do it via something as simple as a Skype call, then record the call, and publish it after editing. For clearer audio, it's recommended to record on both the devices and stitching the recordings together in post-production for resulting in a hiccup-free audio. Transcription allows you to convert your podcast audio into text, which you can publish as a blog post along with show notes for a particular podcast episode. What this does is that it results in bonus content, and a LOT of content in comparison to regular blog posts, as podcast episodes tend to cover a lot more stuff in comparison within a relatively short time. This is a tactic that's employed by many smart content marketers these days. You're essentially generating two pieces of content (as the textual content isn't duplicate per se to search engines like Google) while putting in the effort of producing just one. Because podcast listeners are very tech-savvy in comparison with the general population, targeting them via ads is relatively less costly, as you don't need to spend on non-targeted mediums of advertising like TV ads, which they're less prone to. According to a blog post by Buffer, the best schedule for publishing podcast episodes is once per week. It ensures a balance between total reach and engagement. They also mention Tuesday as the most favorable day to publish your podcast episode, with the same two goals in mind. If you're ready to invest a little bit up front to ensure a better recording quality, the first thing you should invest on is a quality condenser mic that has USB output. The 'Blue Yeti' microphone is probably the most popular USB mic to have ever existed, and it does a pretty good job for recording podcast audio. You can also add a few other bells and whistles if you really want to - like a pop filter and a pair of monitoring headphones. For recording multiple people who are present at the same location with a single mic, dynamic mics are a better option than condenser mics. As a beginner, if you want to edit your recorded podcast episodes, something simple and free like Garageband (Mac) or Audacity (Windows) will suffice. If you want a premium solution later, you can opt for something like Adobe Audition. Feel free to use it. You can find the embed code right below the infographic. Thanks! Glad you liked it, Lisa. Thanks for putting the info together, its a really insightful article. I didn’t even know some of the things myself. Is it okay to use on my website? I will include a link back to you. Great graphic! What is the source for the ad revenue numbers? Gavin – AWESOME graphic!!! Seriously, so informative and helpful. I’m in production of a new podcast, MADE To Be, featuring extraordinary women in business. Will share this infographic on a post about podcasting soon. Thank you!